Reboot has been responsible for producing some of the most influential and innovative Jewish books, films, music, digital platforms and large-scale public events of the past five years. These projects include the National Day of Unplugging, 10Q, Death Over Dinner - Jewish Edition, Silver Screen Studios, The Kibitz, Beyond Bubbie, Unscrolled, the Sabbath Manifesto, Sukkah City, the UNDO list, the DAWN Festival, East Side Jews, the Idelsohn Society of Musical Preservation, and more! Over the past three years alone, these nationally-visible projects have become more numerous, diverse and impactful. Discover the impact of one of our main programs, The National Day of Unplugging. USA Today: What’s More Jewish Than Asking Questions? The Wall Street Journal covers “Beyond Bubbie: Tales from the Kitchen” at 92YTribeca. The New York Times spreads the word on Bubbie. More on Beyond Bubbie from New York Magazine’s Grub Street. NBC on Beyond Bubbie’s creation. Mercury News discusses latkes and bubbies with Wise Sons Deli. JWeekly: Six Words to Fame? Try it! San Francisco Chronicle: Jewish Record Store Popping Up for a Month in S.F. NPR: The Secret Musical History Of…”Black Sabbath”? About.com: Looking for Help Unplugging? 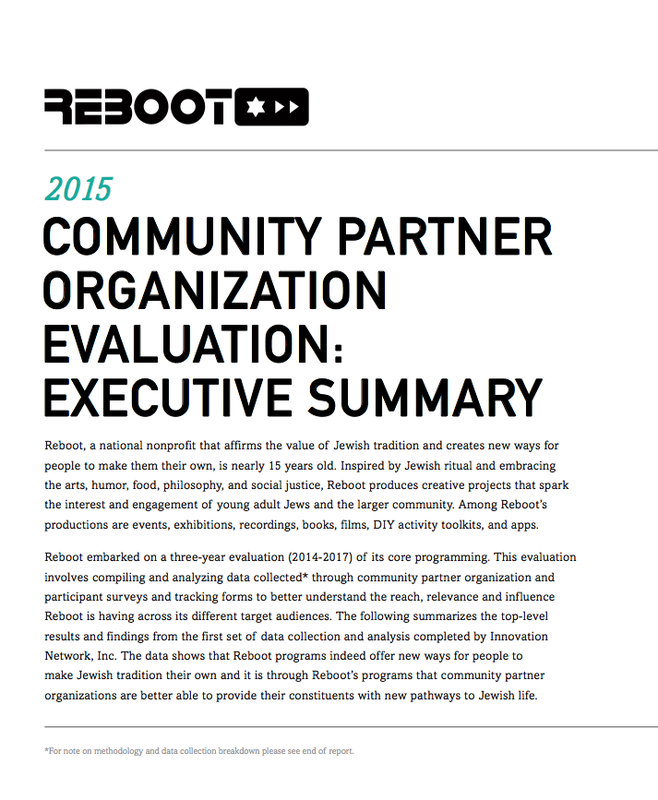 This 2014 network-wide study explored the value of the Reboot network and community for network members and sought to understand changes in members Jewish lives as a result of Reboot's programs and projects. Reboot embarked on a three-year evaluation (2014-2017) of its core programming. The following summarizes the top-level results and findings from the first set of data collection and analysis completed by Innovation Network, Inc. The data shows that Reboot programs indeed offer new ways for people to make Jewish tradition their own and it is through Reboot’s programs that community partner organizations are better able to provide their constituents with new pathways to Jewish life. What emerged was the Re/Book, a design thinking manifesto---outlining six core values and user case studies---for the development of new products and projects that reimagine Jewish lives full of meaning, creativity, and joy. The purpose of this evaluation was to evaluate the Reboot network and explore how Reboot can manage its continuing evolution to achieve increased impact in years to come. Jewish Identity and Community in a Time of Unlimited Choices: This study delves deeply into the mindset of a Jewish cohort that feel largely positive about their Jewish identities but are unsure as to how their religious identities play out in their daily lives. A unique survey examining issues of identity, community, and meaning, from Catholic, Protestant, Jewish and Muslim youth, ages 18-25, across racial and ethnic lines. The findings also represent a snapshot of tomorrow, a glimpse of what may happen when Generation Y matures to the peak of its member’s participatory experiences.